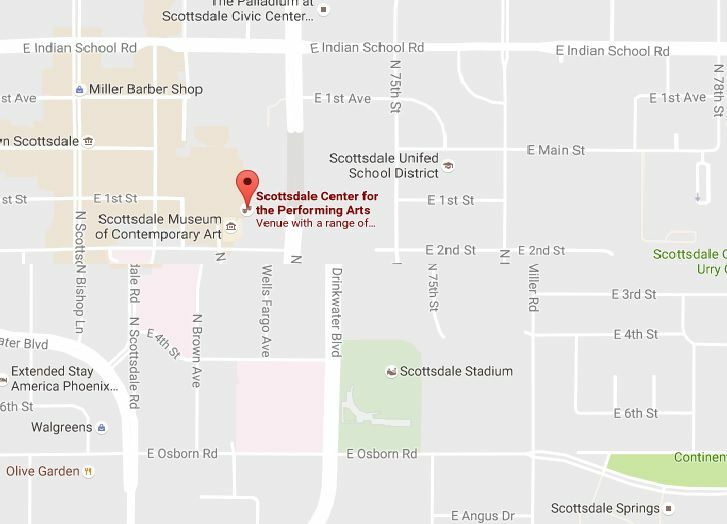 The Scottsdale Center for the Performing Arts houses the Virginia G. Piper Theater and Stage 2 and hosts nationally and internationally known performers and programs. The extensive schedule includes plays, musical performances, lectures, film, dance and more. The Scottsdale Museum of Contemporary Art (SMoCA) is next door. While there is an admission, there are several designated free admission times when you can enjoy the exhibitions there. In addition to fountains, flowers and grassy lounging areas, you'll find the iconic LOVE statue at Scottsdale Civic Center Mall. It's probably the most photographed spot in the Phoenix area! At the library there is a covered parking structure, which many people use for the Scottsdale Center for the Performing arts and SMoCA. Valley Metro Rail does not serve downtown Scottsdale. Check here to see how long it will take you to drive from other parts of town. From Loop 101: Take Loop 101, exit Indian School Rd. Turn left (west) on Indian School Rd. Turn left (south) onto Drinkwater Blvd. Turn right (west) onto 2nd Street. Read reviews and check availability for these hotels on TripAdvisor. Scottsdale Stadium, home of the San Francisco Giants during Cactus League Spring Training, is about 1/2 mile south of the Scottsdale Center for the Performing Arts and Scottsdale Civic Center Mall.